After months of negotiations the Canadian government and the European Union have arrived at the basis for the free trade agreement. This agreement will remove 99% of all tariffs, opening Europe to Canada and vice versa to an unprecedented level. With the groundwork laid, details of the Comprehensive Economic and Trade Agreement (CETA) can now be ironed out. 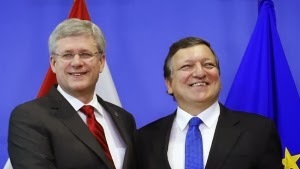 Perhaps unbeknownst to people on both sides of the Atlantic, Canada is among the most important economic partners of Europe, and in 2012 was its 12th most important trade partner (in 2011 the EU was Canada’s second most important partner) (EU Commission Press Release). Between trade and investment huge capital flow exists between the two: “In 2011, the EU’s investment stock in Canada was around €220 billion while Canadian investment in the EU amounted to almost €140 billion” (EU Commission Press Release). We are not talking chump change. So if trade is already good, why free trade? The answer from both the EU and Canadian government is clear. With this agreement both Canada and the EU secure opportunities for growth, prosperity, and development, and it’s not just talk, the numbers are there. When the agreement comes into force the expected rise in “two-way bilateral trade in goods and services” is “23% or €26 billion” (EU Commission Press Release). Europe alone stands to see its “annual GDP [increase] by approximately €12 billion a year” (EU Commission Press Release). Terms of the agreement will also allow European companies to bid on larger projects at the provincial and municipal level in Canada. Canadian media has focused largely on the benefits that Canadian business and consumers alike will enjoy. Cheaper wine and cars, more meat sold on the European market, more of Europe’s cheese, and more investment for research and development of new pharmaceuticals. Prime Minister Stephen Harper echoes this positivity, “This is a big deal; this is the biggest deal Canada has ever made. Indeed, it is a historical achievement” (Harper, Quoted by CBC news). Harper’s excitement is matched by Commission President Jose Manual Barroso, who sees this agreement as the doorway to economic growth, but also as a signal that the tide in Europe is turning: "With this agreement we are also sending an important and positive signal around the world: to markets, to businesses, our trading partners and of course the millions of people across Europe, but also, I believe, across Canada, that are looking for growth and in Europe especially, for a renewed economic drive” (Barroso, Quoted by CBC News). Naturally there are concerns on both sides and some industries are making familiar protectionist claims. Canadian dairy farmers are concerned about losses, particularly smaller producers. Meat farmers may be required to change the production process, as hormone free products are a must for Europe, ultimately influencing the cost of production. Similar fears exist on the European side. Furthermore, skepticism would suggest that the gains made through the free trade agreement are exaggerated at best and untrue at worst. In online discussions (Comments, CBC article) the results of NAFTA are called forth as if offering unequivocal proof that free trade agreements are not to be trusted. In spite of skepticism, comprehensive free trade agreements are becoming the rule rather than the exception, and will continue to be an important part of global business. With talks already underway between Europe and the United States to develop a Transatlantic Trade and Investment Partnership (TTIP), Canada certainly cannot afford to take a back seat and miss the chance to develop their own trade agreement with Europe. Certainly no one can know exactly how CETA will affect each producer nor down to the cent how markets will change, but the available projections are reason enough to be optimistic. Rather than fretting one should consider the broader perspective: CETA will change the way Europe and Canada do business together, allowing more growth and opportunity. In times of economic uncertainty creating room for investment, job creation, and growth is not only advisable, but also wise.